Appearance: Marik Ishtar is a 19 year old Arabian boy. He is an average height boy for his age & his cloting is usually that of a normal boy, white tank top, blue jeans & shoes. But he mostlly wears a long, 6 ft purple cape to distinguish his evil-like side of him. He is mostlly recognized by the rings of gold he wears around his arms & neck as well as golden earings. He has blonde hair & purple eyes with black face paint lines around his eyes. Personality: As a child, Marik was an innocent boy who desired to see the outside world, despite his clan's laws forbidding him from doing so, and was willing to sneak out to fulfill his desire. He cared for his sister Ishizu Ishtar very much and also considered Odion Ishtar to be his brother, despite not being blood related. Marik bore a grudge towards the Pharaoh because he was forced by his own father to guard the family's carving with his life via a ritual of having carvings or tattoos onto his back which brought intense pain during and after the ritual and robbed him of his freedom. 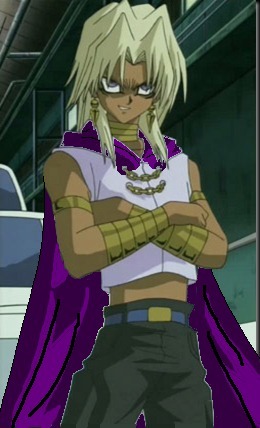 With the intense pain and his hatred towards the Pharaoh, he spawned his second personality Yami Marik to deal with the pain. Biography: Marik's family guarded the tomb of the Pharaoh for generations and two Millennium Items (the Millennium Rod and Millennium Necklace) were passed on to Marik and his sister Ishizu Ishtar. Marik was forbidden to leave the Pharaoh's tomb due to his father's fear that the freedom and marvels of the outside world would further divert Marik's attention from his heritage. Marik no longer wanted to become a Tombkeeper, so his adoptive brother Odion Ishtar asked if he could take Marik's place but was refused. When Marik was forced to take the initiation ritual to become a full Tombkeeper, Marik spawned his second personality Yami Marik from the pain he endured. A year later, Marik and Ishizu took a forbidden trip to surface but their father found out and attempted to kill Odion. In the misdt of his father's torture of Odion, Marik blanked out and his second personality Yami Marik emerged for the first time to resist his father's punishment and claimed the Millennium Rod for himself. Ignoring his father's orders to put it down, Yami Marik used its powers to smash him against the wall. When Ishizu protested, she suffered the same strike. Yami Marik then proceeded to kill his father. After Yami Marik was sealed away in Marik's body by Odion, Marik believed it was the Pharaoh that had killed his father. After he got out of his tomb keeper life, he received a dinosaur at the age of 19 & has been JFC training ever since.